A charming, whimsical story of what happens when a long-serving and long-suffering monarch decides to go AWOL. A richly witty, warm and wonderful novel of responsibilities, escape and friendship. Her Majesty, Queen Elizabeth II, is growing increasingly disenchanted after her decades of public service and years of family scandal. One day, the Queen takes things into her own hands and, in a spur-of-the-moment decision, leaves the palace alone and incognito. An unlikely group of six, including two of the Queen’s most trusted household staff members, William and Shirley; one of her loyal ladies in waiting, Lady Anne; an equerry fresh from the battlefields of Afghanistan, Luke; a young equestrienne who minds the horses in the Royal Mews, Rebecca; and Rajiv, an Etonian spending his early 20s behind the counter in an artisanal cheese shop in Mayfair, and moonlighting as a tabloid photographer, are the only ones who know of her disappearance. They vow to find her and bring her back to the palace before MI6 turn her Scottish sojourn into a national crisis. Capturing the faded but enduring glamour and glory of a seemingly old-fashioned institution, and a woman who wonders if she, too, has become outmoded, this is a charming, witty and poignant novel of responsibilities and freedom. We all thoroughly enjoyed this novel. It brought together characters from across the Royal household, crossing the boundaries of social class, to establish respect for and friendships with each other. At the heart of the novel, though, is The Queen. She was a real person with worries and doubts about her purpose and position. She had the same emotions as everyone else and we all felt real empathy with her. This was a wonderful ‘non-portrait’ portrait. At the beginning of the novel staff were protective of ‘The Queen’ as an institution. By the end of the novel they were protective of ‘The Queen’ as a person. 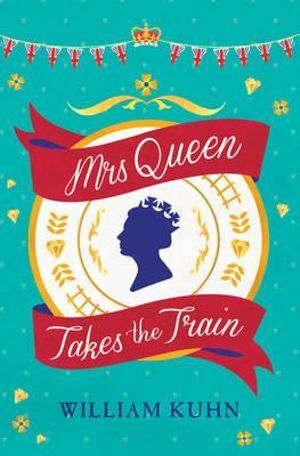 This entry was posted in Book Club Kits, Fiction, Recommended Reading, Staff Favourites and tagged Book Club Kit, book review, mrs queen takes the train, william kuhn by Jody. Bookmark the permalink.